Nestling in a quiet delightful rural setting, Chilton Country Pub & Hotel offers an excellent range of facilities, including a bar, restaurant and 25 bedrooms that have been decorated to a high standard and overlook the countryside with ample car parking for guests. Celebrating the ninth year of this festival, we are be bringing some well known names to the county from around the UK and across the English Channel. 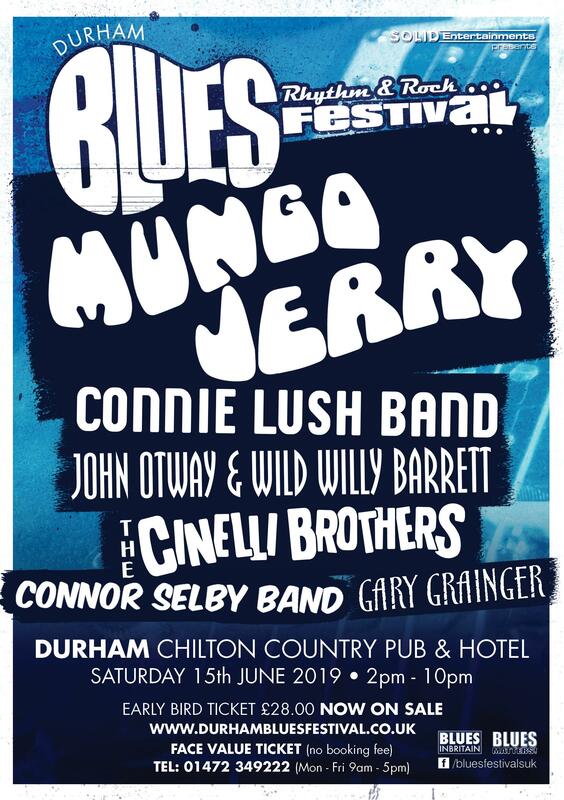 With Mungo Jerry headlining and five other very different, but striking bands in the line-up, this will undoubtedly be another great festival and one live music event not to miss in the North East! Mungo Jerry’s “In The Summertime”, was one of the fastest selling singles of all time. It was recorded early in 1970 and within weeks, the record had become a global hit sending its composer, lead singer and front man, Ray Dorset aka Mungo Jerry into a completely different world from being a semi-pro musician to an overnight international star. It had an astonishing impact on the music world and raced to number one just a fortnight after its May 1970 release, remained there for an impressive seven weeks and became the year’s best selling single. Mungo Jerry –what else is there to say! Connie Lush Band – is regarded as one of the finest blues singers in the UK, five-time winner of best UK vocalist, twice European Blues vocalist of the year, she has performed at some of Europe’s most prestigious festivals! John Otway and Wild Willy Barrett - don’t know what to expect, then be prepared for everything from bare-chested theremin playing to wah wah wheelie bin as the duo jump from one hit and 40 near misses to another! The Cinelli Brothers – Marco & Alessandro Cinelli champion a new generation of passionate musicians sharing a love of Blues, Soul, R&B and the true authentic sounds that have made blues a cornerstone of music history!
. Connor Selby Band – inspired by musicians that emerged in the 1960s citing Eric Clapton as his first and current major influence, putting particular emphasis on his output with John Mayall and The Bluesbreakers and Cream! · Gary Grainger– his interest in blues goes back a long way and current sets include a mixture of traditional & modern blues tunes, featuring songs by bands such as Little Feat, Grateful Dead, the Allman Brothers - & ZZ Top ! Don’t be late, doors open at 1.30 p.m. and the music starts at 2.00 p.m. and ends at 10.00 p.m.